Wells Fargo has a rich history of using, owning, guarding, and operating the six-horse stagecoach. We still own and display ten originals in our history museums, thirteen authentic reproductions in our buildings, and a fleet of 17 that roll almost every weekend in parades and events across the nation. Built high and wide to handle the rough, rutted roads of a new country, the design of this classic American vehicle was perfected in Concord, New Hampshire. 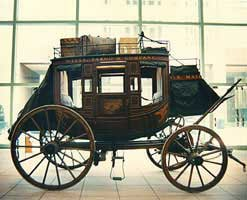 Carriage builder J. Stephens Abbot and master wheelwright Lewis Downing built the famed stagecoaches of Wells Fargo & Co. The curved frame of the body gave it strength, and perhaps a little extra elbow room. Perfectly formed, fitted, and balanced wheels stood up to decades of drenching mountain storms and parching desert heat. The unique feature of these coaches was the suspension. Instead of steel springs, the coach body rested on leather “thoroughbraces,” made of strips of thick bullhide. This feature spared the horses from jarring and gave the stagecoach a (sometimes) gentle rocking motion, leading Mark Twain to call it, “An imposing cradle on wheels” (Roughing It, 1870). Concord Coaches weighed about 2,500 pounds, and cost $1,100 each, including leather and damask cloth interior. Wells Fargo is fortunate to be able to display original Abbot-Downing Concord Coaches in the Wells Fargo history museums and exhibits across the country. Each coach was given a number by the Abbot-Downing factory and carries with it its own story. Gold dust, gold bars, gold coins, legal papers, checks, and drafts traveled in the famous green treasure boxes, stored under the stagecoach driver's seat. Loaded with bullion, they could weigh from 100 to 150 lbs. "About as much as one likes to shoulder to and from the stages," wrote John Q. Jackson, Wells Fargo agent, in an 1854 letter to his father. Because they carried the most valuable assets of the West, these sturdy boxes of Ponderosa pine, oak, and iron were more prized by highway bandits than anything else. But the real security of the treasure boxes came from who was guarding them — the Wells Fargo shotgun messengers. They were "the kind of men you can depend on if you get into a fix," according to Wells Fargo detective Jim Hume. If thieves were foolhardy enough to try and steal a treasure box in transit, they would find themselves staring down the barrel of a sawed-off shotgun, loaded with 00 buckshot, possibly held by Wyatt Earp himself. Despite these efforts, there was a masked highwayman who managed to rob 27 stagecoaches — the infamous Black Bart. Wells Fargo detectives eventually caught up with him. He served his four years in San Quentin and then disappeared forever. From 1852 to 1918, Wells Fargo rushed customers’ important business by any means — steamship, railroad, and, where the railroads ended, by stagecoach. At first, Wells Fargo contracted with independent stageline owners. Then in the great enterprise of building reliable transcontinental transportation, Wells Fargo came to own and operate the largest stagecoach empire in the world. Since then, Wells Fargo has been forever linked with the six-horse Concord Coach charging across the vast plains and high mountains of the West. In 1857, Wells Fargo joined other express companies to form the Overland Mail Company, establishing regular twice-a-week mail service between St. Louis and San Francisco. Until the stageline, communications east and west was twice a month by steamship. Wells Fargo got the route surveyed and shared in the financing. Nicknamed the “Butterfield Line” after its president, John Butterfield, it ran 2,757 miles through the Southwest via El Paso and Los Angeles and then up through California’s Central Valley to San Francisco. Night and day the stage rolled on at a pace from 5 to 12 miles an hour, across vast, treeless plains, jagged mountain passes, scorching deserts, and rivers cursed with quicksand. The coaches stopped only to change horses or let passengers slug down a cup of coffee with their beef jerky and biscuits. About 25 days later, it clattered into San Francisco. In 1861, the Civil War forced overland staging to a central route across the Great Plains, through the Rocky Mountains, into the Great Basin, and over the Sierra. The Pony Express had proven that the nation’s mail could be carried swiftly across this rugged route. Along this route mail, passengers and Wells Fargo’s express rode the stages of the Pioneer Stage Line from California to Virginia City, Nevada. The Overland Mail Company, by now under Wells Fargo’s control, ran coaches from Virginia City to Salt Lake City, Utah. There, mail and passengers connected with Ben Holladay’s Overland Express running through Denver, Colorado, and eastward to the Mississippi. From April 1860 to October 1861, young riders relayed mail across almost 2,000 miles from St. Joseph, Missouri to Sacramento, California in only 10 days. In its final months, the Pony Express became part of the stagelines’ U.S. Mail contracts. The Wells Fargo-run Overland Mail Company operated the Pony Express from California to Salt Lake City. In 1866, Wells Fargo bought out Ben Holladay's expanding network and combined it with the Pioneer and the Overland Mail stagelines to create the largest stagecoach empire in the world. Stagecoaches carrying the Wells, Fargo & Co. name rolled from Nebraska to California via Denver and Salt Lake City. From Denver, coaches served the mining towns of the Rockies, and from Salt Lake City, they carried mail and passengers to Montana and Idaho. Gold brought miners to the mountains of Montana and Idaho, and Wells Fargo's stagecoaches carried it out. W. H. "Shotgun" Taylor supervised the stage operations, and hired drivers who could handle a team of horses around mountain roads with calm grace. In 1869, at Promontory, Utah, dignitaries hammered in a Golden Spike, which joined the rails of the Transcontinental Railroad — and ended Wells Fargo’s overland stageline. However, stagecoaches continued rolling wherever the railroads did not. Wells Fargo contracted with independent stageline operators to carry treasure boxes and express, even into the early 20th Century. Whether in Sierra mountain towns, northern Minnesota villages, Pacific Northwest coastal farms, or west Texas ranches, stagecoaches carried Wells Fargo customers’ business wherever they lived and worked. As symbol of our image, heritage, and values, the legendary stagecoach is priceless, and Wells Fargo strives to present it to our communities. Every year, people across the nation see the horse-drawn stagecoach of the Old West in their streets. You can experience the sight and sound of the Wells Fargo stagecoach rolling at parades and events. On special occasions, you may even take a ride in this amazing piece of American history. Each coach used for parades is an authentic, Wells Fargo approved reproduction, pulled by a specially trained team of horses, guided by an experienced driver. All appearances of the Wells Fargo Stagecoach are arranged by and for Wells Fargo managers. Please discuss any request for the Coach with the people from Wells Fargo in your area. Please note: The coach is for civic, non-partisan parades, and for Wells Fargo's marketing events. Over 160 years ago, Henry Wells and William G. Fargo founded our legendary company. Through prosperity, depression and war, post-war prosperity, social changes, and changing communications, Wells Fargo’s attention to customer needs has remained constant. Visit the Wells Fargo History site for archives and to learn more about our heritage.